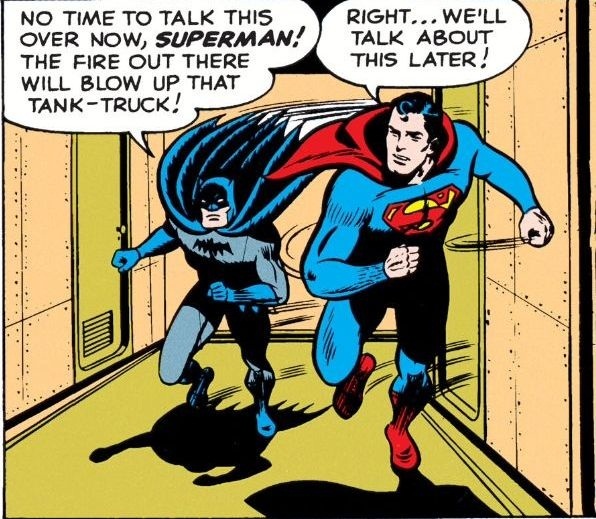 With Batman v. Superman Dawn of Justice hitting the big screen today, I thought I'd share with everyone, who may not already know, their first meeting in comics. It only took 11 years after the introduction of Batman and 12 years after Superman in comics, two of DC Comics biggest superheroes, to finally meet in the pages of the Golden Age classic Superman #76. Do to overcrowding on a cruise ship, Bruce Wayne and Clark Kent are forced to share a room. While they are both worried that their secret identities will be revealed, a jewel thief starts a fire on the docks to make a distraction for his getaway. 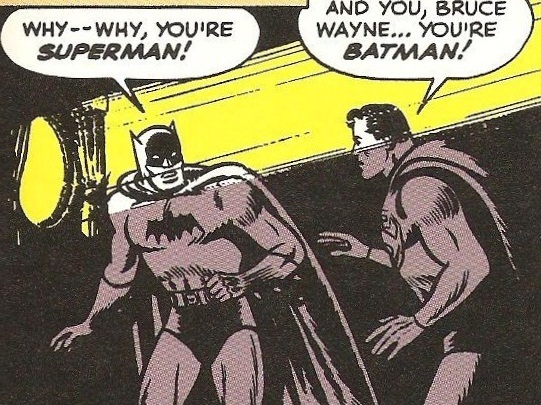 The always clever Bruce Wayne comes up with a plan to change into his Batman costume without Clark Kent finding out he's Batman. He tells Clark that he's tired a is going to sleep. Under the cover of darkness, Bruce then changes to become Batman. But, Clark had the same idea. As the lights were out, Clark also changes into Superman. These are two really clever guys. I mean, what could go wrong? Well, the light from the fire shines through the window of their room revealing their secret identities to each other. That in a nutshell is how the two realize who each other is. To me, it's a little corny. But it was a different time. Let's talk about some sales now. 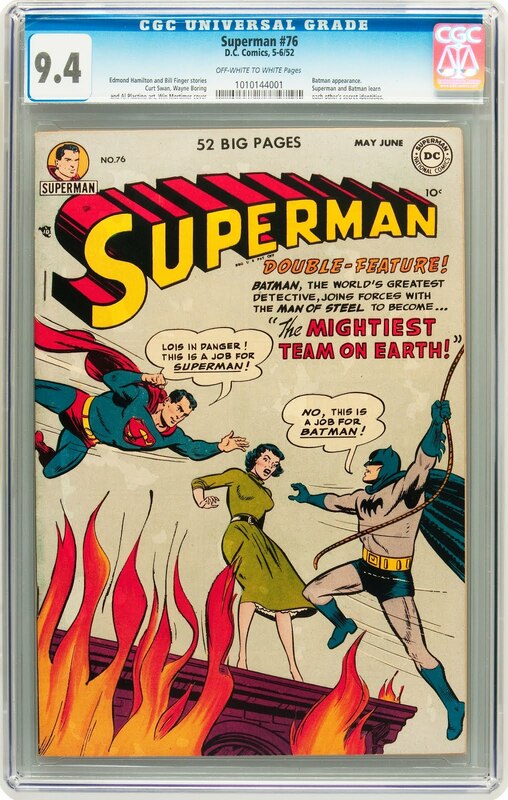 So far, there are 199 copies of Superman #76 graded by CGC. Two of those copies share the graded highest at a 9.6 NM+. Now, with so few copies in the CGC census, there are even fewer sales as you can see by the chart. I couldn't find any sales data for a 9.6 NM+, if there even are any. However, in Sept 2014, an 8.5 VF+ sold on eBay for $3250 (also shown in the chart). It's a well known key issue and obviously not cheap. Even low graded copies could cost you many hundreds of dollars. 4.0 VG copies have sold over the $1000 mark. So if you're looking to add an already graded copy of this comic to your collection, don't expect it to be an easy find, or a cheap one. I wish you luck on your hunt.